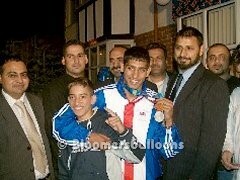 Are proud to have been invited to decorate the home of Bolton's own Olympic Boxing Silver medalist Amir Khan. 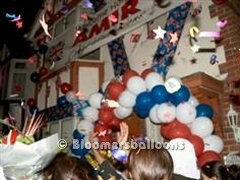 Starting early in the afternoon, we built an arch across the front doorway in red, white & blue balloons to invite Amir home. 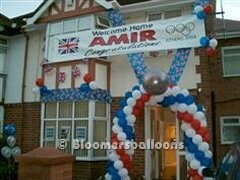 We draped Union Jack fabric from the house eaves to hold a 3 foot exploding silver balloon filled with small red, white & blue balloons & confetti to represent Amir's silver medal. 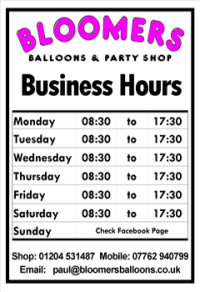 A fifteen foot banner was placed across the front of the house with balloons at each corner. 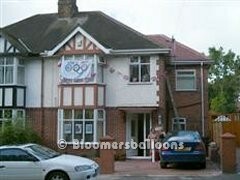 More balloons and Union Jack fabric over the front window completed the decor to the house. 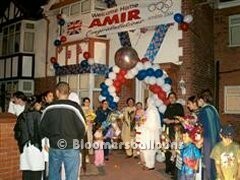 Evening came and Amir's family and supporters gathered in anticipation of his return. We provided a floodlight to illuminate the forthcoming proceedings as the only other people with a light source were the TV camera crews. Amir arrived in a Hummer-based stretched limo to a background of air horns, cheers and applause. Smiling from ear to ear, Amir shook hands and hugged supporter after supporter before finally reaching his family waiting in front of the family home. 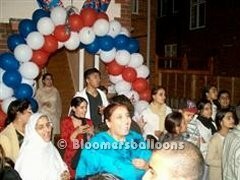 As Amir reached his mother standing under the balloon arch, his aunt popped the exploding balloon, showering everyone with confetti and small balloons & raising a deafening cheer from the assembled onlookers. Initial greetings over, Amir took time to pose for the photographers among us. Interviews were also given to TV and newspaper reporters plus autographs for the supporters. Drummers arrived, seemingly from no-where and the party really got going to the delight of Amir's family & friends who looked on as family & supporters took turns to show off their dancing prowess. 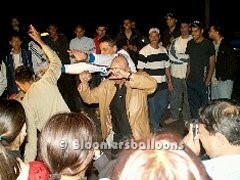 As more and more people were drawn to the sound of the party, the street filled with dancers and the traffic was halted. All good things must come to an end & this party was no exception. 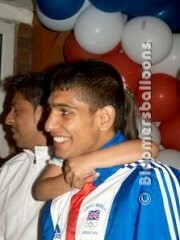 Eventually we switched off the lights, the supporters dispersed into the night, leaving Amir & family a private moment to themselves. We returned early next day to quietly repair the damage to the decorations just ahead of a Granada Reports film crew recording an interview with Amir's father - it doesn't get much better than this.